Book 3 of the Oz series. It was the first in which Baum was clearly intending a series of Oz books. 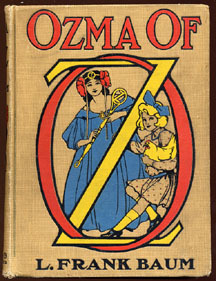 It is the first Oz book where the majority of the action takes place outside of the Land of Oz. It was the first in which Baum was clearly intending a series of Oz books. The novel was adapted into a play, films, and even an anime TV series—later shortened and edited into a single feature. — Excerpted from Ozma of Oz on Wikipedia, the free encyclopedia. This page was last edited on 10 June 2018, at 06:52.